Medium Economy Balance Training System for Surfers, SUP and Water Sports. 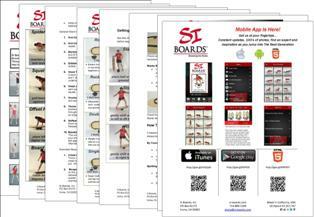 Balance Board for Multi-Direction, Free Rotation Stability Training for Pop-Ups and Rotation Power. The perfect combo to get your feet wet, carve turns with confidence and progress to the next level with a larger ball and half ball. Get more tilt and space for your rotational training. A great economy board for travel and outdoor training. Ride Stance: 20" - 38"
Get our popular design in the Surf Starter and zero in on the next wave. We shaved weight off the nose to carve a turn with quicker precision compared to our elliptical models. The stable fish/swallow tail keeps your base grounded as you whip this board in, out and around. Bump up your dry land training and your next session will be amazing. Large ride stance area can be used directly over the bolt holes or moved out another 6" inches to the ends. Plenty of space for two balls or half balls for upper body exercises. Pop up moves will require you to keep a narrow landing stance over to the rail with this model. This board will allow a variety of moves and positions. 3" Mini Ball is quick, responsive and requires fine tuning of your movements. With little board tilt and a ton of forward and backward ride space, you r board control will always be challenged to stay level. Staying centered is no easy feat with this Mini Ball. Combine both balls under the board for the double pivot system for skill progression. 5" Small ball makes the transition from smooth moves to fast turning very easy. Enough space for forward and backward motion to give you 360o degrees of free movement. Get up high with lots of board tilt and feel your hips control the board. This combo is fun and responsive. 5" Half Balls are great for practicing pop ups and plank walking at the beginner level. Create your own rocker or wobble board and combine lower body balance with upper body complex moves. 6.5" Half ball gives you greater board tilt and ability to rotate on the half ball. Perfect for developing your carving and rotation power as you kick this board around. Create your own unique combo with this board. Add the balls and half balls that meet your training needs. Features an adjustable rail that can be lengthened or shortened in 4" inch sections. A great board choice for those who will grow with their board and want to practice a wide range of stances. 20" x 9.5" x 1"
This set has everything from beginner to semi-advanced levels! My son, age 6, enjoys the beginning levels, and continues to enjoy them, while I brush up on some surfing skills I haven't used for over 8 years! Thank you SI Board for letting me get a feel for the real waves, in land, again!